Reed College Campus Safety Officers Unite! 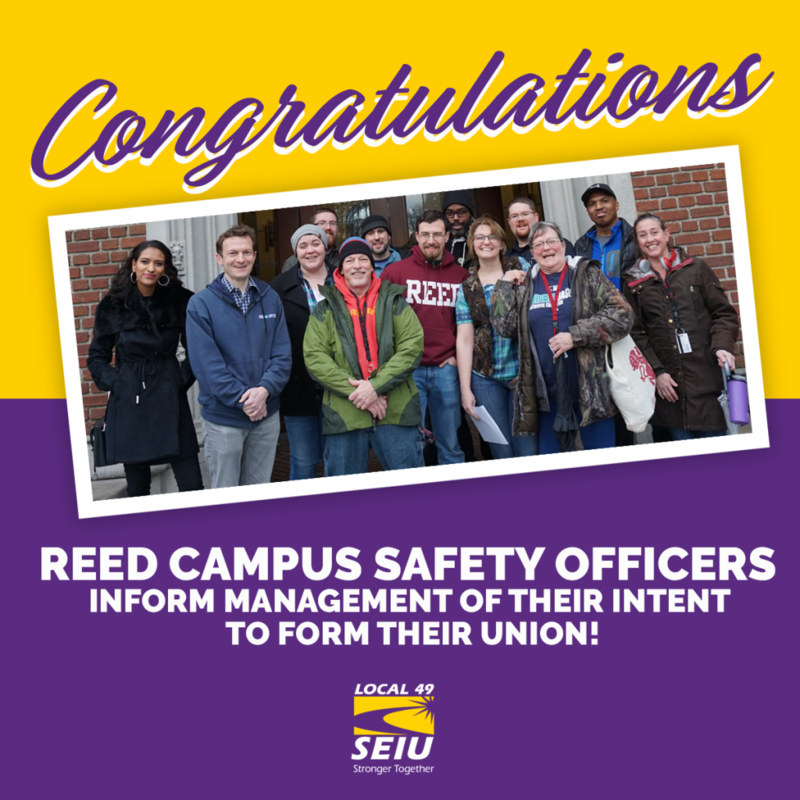 With unanimous commitment from their coworkers, Reed College Campus Safety Officers delivered a letter informing management that they’re forming a union and asking for the college to agree to a fair process The delegation also included supporters and coworkers from Reed’s Custodial Services department (already SEIU 49 members) and Portland Jobs with Justice. Campus Safety Officers are forming their union to improve public safety and working conditions through efforts rooted in safety, respect, and community. Read more in the letter below. We are the Community Safety Officers who provide a safe college community 24/7/365. We take our role in the Reed College Community seriously, and we are reaching out to you because we believe that changes need to be made to keep our community safe and acknowledge the value of all members in the community. We take pride in the work that we do. We came to Reed College to be part of a community committed to the values that we share. CSOs are an important part of ensuring safety of Reed College students, the faculty, staff, and community members. Whether we’re managing the switchboard, unlocking a door, responding to a medical emergency, or taking a report, the work of CSOs is vital to the Reed community. Safety – A safe campus community, tools to support the security of the campus, and for resources to maintain a safe workplace. Respect – Respect for the work that CSOs do, and our role in the Reed community, and respect for our time, both in and outside of work. Community – Developing deep connections to the Reed community. CSOs engaging with all members of the Reed Community, and for staffing that supports these deep connections. Our hope to work in an environment which reflects theses ideals has not been met. We are organizing to form a union with SEIU Local 49 because for too long our concerns have been ignored. We ask that Reed College commit to a free and fair process for us to form our union. We expect to receive a response by 1/25/2019. To reach us, contact Scott Cheesewright, ScottC@seiu49.org. Why are CSOs organizing a union? Community Safety Officers are forming a union for many reasons, united by a common theme – they’ve raised concerns again and again, but have felt ignored. With a union, Reed community safety officers can sit down with the college administration and ensure that their voice is heard. You can read more about the reasons CSOs are organizing in a piece in the Reed Quest here. Community Safety Officers are forming a union so they have a meaningful voice in their working lives. Right now, they are asking Reed to agree to a fair process to form their union, to agree to recognize their union through a process called Voluntary Direct Recognition—that means that Reed would agree to respect workers rights to form a union without retaliation or stall tactics. In the US, there are two primary ways private sector workers can form a union—through a National Labor Relations Board (NLRB) Election and what is known as Voluntary Direct Recognition. The 65,000 strong union security officers—including hundreds of Portland security officers—have formed their union through this Direct Recognition process. Why don’t they just hold a union vote? The reason security officers go through the Direct Recognition process is twofold. Under our federal labor law, a section called 9(b)(3) prevents the Labor Board from certifying a union as the representative of security guards if they are in a ‘mixed union’ with nonguards. The 9(b(3) section was created in the 1940s and many feel this ‘guard exclusion’ was crafted to limit the power of unions and that it is an outdated model that needs to change. That said, ANY employer can voluntarily recognize a mixed union to represent security guards—like the 65,000 union security officers who are part of a strong union with janitors, healthcare workers, etc. The Direct Recognition process is a simple, straightforward, fast and fair method to form a union compared to NLRB Elections. Responsible companies who respect workers’ rights to form a union without stall tactics or fear respect this Direct Recognition process, which entails a majority of workers at a site signing union cards. Simple. SEIU is the largest security officer union in the nation–with 65,000 officer members who work for many companies, protecting many sites including office buildings, colleges, hospitals, stadiums, research facilities and more. Union officers have been able to win better pay, affordable quality healthcare, adequate training, respect and the list goes on. 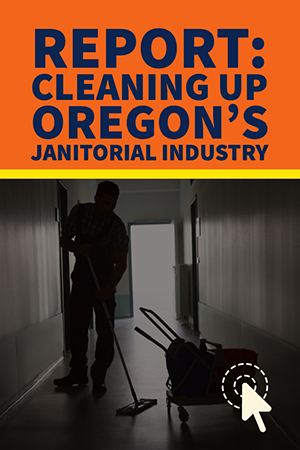 At Reed College, the custodial staff are proud SEIU members and have been for 40 years. Reed College Community Safety Officers work hard every day to protect students, faculty, visitors and campus property. CSOs deserve the right to join the union of their choice. SEIU is the largest officer union in the country fighting to improve industry standards. We are strong because we are a mixed union that works together—security officer, janitors, healthcare workers and more.